Three Years Later, Is Santa Monica’s Bike Action Plan Working? 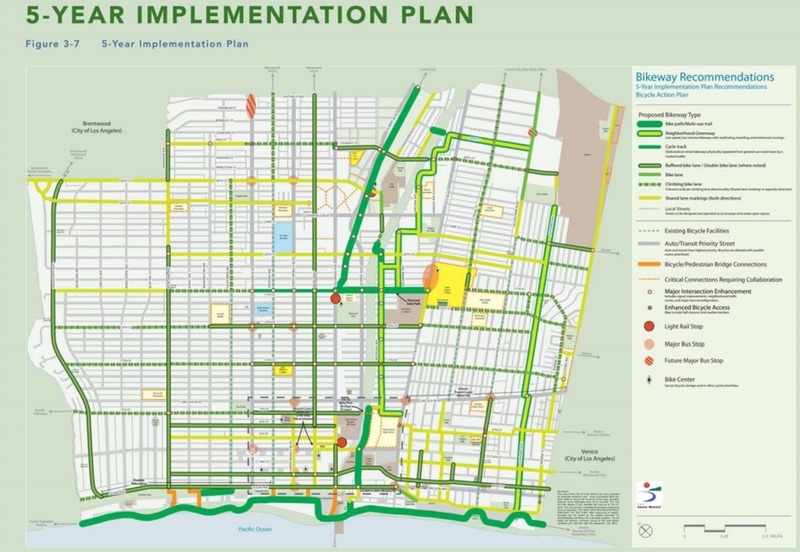 In November 2011, the Santa Monica City Council unanimously — and enthusiastically — adopted the Bike Action Plan (BAP), an ambitious 300-page document that seeks to transform the bayside city into one of the most bike-friendly cities in the country. “People want a little bit of Copenhagen here by the sea,” Lucy Dyke, the City’s deputy director of special projects, told the crowd gathered in November at Santa Monica Spoke’s celebration of the third anniversary of the BAP’s approval. The goal: to get more people out of their cars and on to bikes — the BAP sets a target of getting Santa Monicans to take 14 to 35 percent of all their trips on bicycles by 2030 — by making active transportation a safe, comfortable, and convenient option in the bayside city. 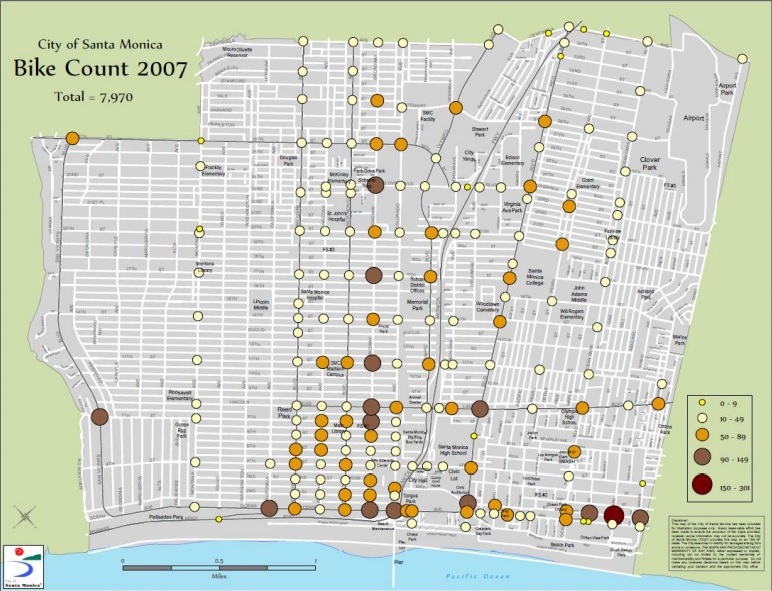 From the City’s bike count in 2007. High bike density intersections (intersections that see between 150 and 300 bikes pass through) are indicated with deep red circles. Biking is up in Santa Monica. Way up. Since 2000, the city has seen a 356 percent increase in the number of people on bikes, well above the national average of 61 percent increase. All the while, the number of crashes in Santa Monica is down, according to City officials. “There are actually fewer bike crashes in 2013 than in 2010,” Dyke said. According to Dyke’s report, there were six fewer bike crashes reported last year than 2011. That isn’t to say crashes aren’t still a problem. Since 2011, the Santa Monica Police Department said they have investigated 874 serious collisions, which resulted in death or injury and involved peds and bicyclists. 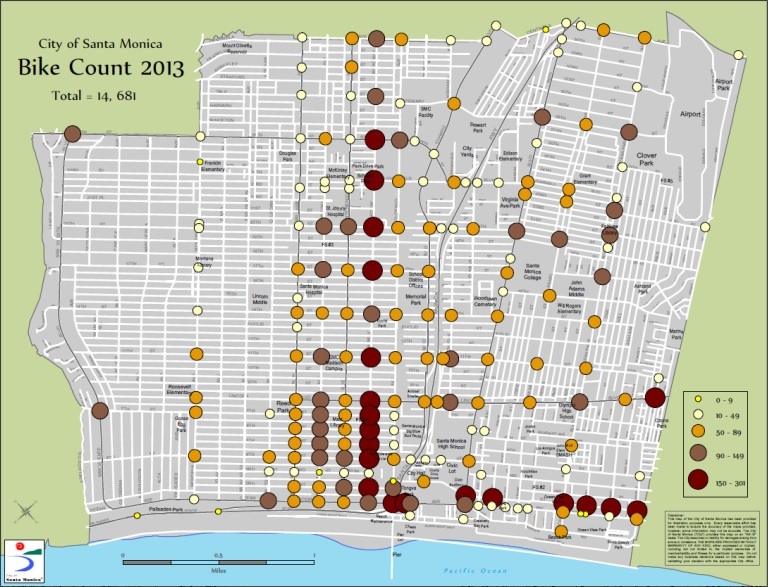 In 2013, the City saw a significant increase in the number of high bike density intersections. Intersections through which more than 200 bikes pass through each day, Dyke said, see fewer crashes. And the number of intersections with that volume of bike traffic has been increasingly significantly throughout the city. Santa Monica has also taken the lead on regional bike share after the City Council approved what could be the County’s first public bike share system last month. Since the BAP was approved, Santa Monica has also seen its status as a League of American Bicyclist Bike Friendly Community improved. The city went from “bronze” to “silver” status this year. “The City scored highest in the categories of public perception and (low) fatalities and lowest in the categories of overall crash rate and share of residents who are bicycle commuters,” according to City officials. “This year, one of the things that’s new, is the City is going to pay for a part-time person to help coordinate with the School District” for Bike It! Walk It! events and other such programs, Dyke said. According to official numbers, 4,000 Santa Monica-Malibu students walked, biked, or rode the bus to school during October’s Bike It! Walk It! Week, which was a record level of participation. Events like Bike It! Walk It! are instrumental in encouraging future generations to get around their city safely on foot, on bike, or by bus. The role of enforcement came up at the November meeting. Recently, the Santa Monica Police Department has begun a series of operations targeting unsafe road users, including drivers, bicyclists, and pedestrians. But, so far, most of the safety education has been targeted at people who ride bikes. There is the Bike Campus down at the beach where Santa Monica Bike Center staff hold bike safety lessons. And Santa Monica Spoke has also put out a guide to educate road users about their rights and responsibilities. Dyke also pointed out that about 90 percent of the bikeways planned for the first five years of the BAP’s implementation are done. And, new, improved bike ways, like Main Street and Broadway have seen the most increase in riders. “I can say with a great degree of confidence that when we make higher quality bikeways, that’s what people choose to use,” she said, adding that Ocean Park Boulevard has seen a 95 percent increase in the number of people on bikes since the City added green bikeways. Since the BAP was approved, bike lane and sharrow miles are up 122 percent and bike parking spaces are up 210 percent, Dyke said. This year, the City added nearly 2,000 new bike parking spaces with another 1,900 expected to come online next year as part of the City’s strategy to get people biking to the new Expo Light Rail Line. The Michigan Avenue Greenway, which will connect the Expo Light Rail bike path to the beach by way of Santa Monica High School, is also slated to start construction in March. And, Dyke said, it is “very likely” that all the city’s current bike lanes could end up getting greened, like the lanes along Broadway and Main Street. The City’s award-winning Bike Center in Downtown Santa Monica is another major — and visible — success of the BAP. The Center, which offers 24-hour secure bike parking to members, sees an average of 40 round-trip bike commutes daily. It’s also an excellent place for short-term bike parking, offering non-members a secure place to stow their bikes (for free for the first two hours). “A lot of people don’t know really know that they can leave their bike Downtown at the bike center for a couple hours free,” Dyke said. But Dyke warned that more work needs to be done to get those in the city who may be interested in riding but remain concerned about safety on bikes. “We’ve done a lot and we’ve gotten to a place where we could sort of be hitting a wall” in terms of the number of riders, she said. The main issue is that new riders need to have access to routes that feel safe and protected bike lanes could go a long way toward that goal. “We really need to do a lot more if we’re going to get the additional separated bikeways east, west and north, south… because it’s harder to do and there’s not a route identified for them,” said Dyke. More neighborhood greenways, in the model of the Michigan Avenue Greenway, can also help to provide safe-feeling routes that could encourage first-time riders. Santa Monica tomorrow will join the ranks of cities using real-time information to encourage biking, through installation of an automated bike counter located at Main Street just south of Colorado Avenue. The official ribbon cutting will be tomorrow-Wednesday at noon.